My husband and I went to Thor, Kurt Gutenbrenner’s restaurant inside the Rivington hotel. As I watched my husband reach for the bread basket, I started thinking about possible new healthy recipes to entice him away from all the processed carbohydrates. Sadly, he consumes about three times the daily allowance according to MyPyramid, the new food pyramid adopted by the USDA. Our first course promptly arrived, an amazingly fresh and scrumptious curried crab salad tossed with whole leaves of tarragon. I took a sip of my Albariño, eyeing a miniature sautéed crab cake resting on top. Curry mixed with tarragon might sound a bit odd but when I tasted it, I was fascinated by the lively, spicy combination. My husband enjoyed it so much that I decided to mimic the flavors. I created a healthier, low-fat chicken recipe, the more affordable version to serve at home. I used a korma curry spice mix that has a sweeter flavor in comparison to most dried curry powders you find in the spice aisle. 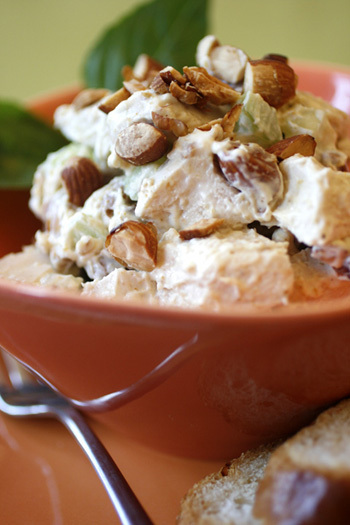 Find out how to make my recipe, Curried Chicken Salad with Tarragon and Almonds.